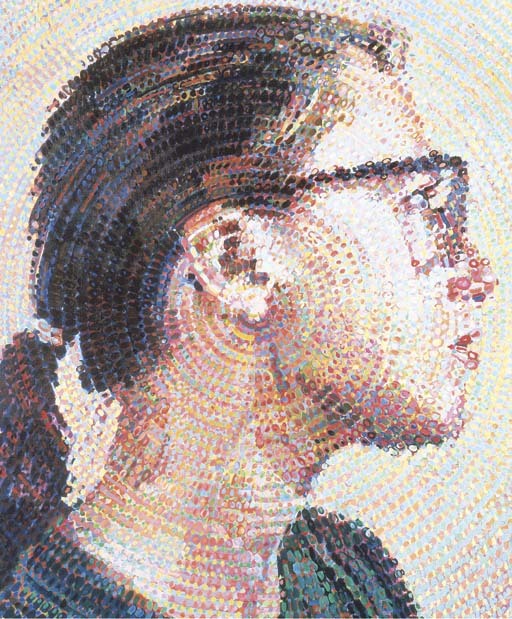 L. Nesbitt, "Chuck Close", Artforum, January, 1989, p. 110 (illustrated in color). C. Finch, "Color Close-Ups", Art in America, March, 1989, pp. 113-119 (illustrated in color, p. 116). J. Guare, Close Life and Work 1988-1995, New York, 1995, p. 57, pl. 8 (illustrated in color). New York, American Academy and Institute of Arts & Letters, Exhibition of works by newly elected members and recipients of the "American-Institute Award", May-June 1991. Tel Aviv Museum of Art, A Passion for the New, October 1995-January 1996, p. 49 (illustrated in color). "When I was doing that series of people, I had just spent years, after initially painting mostly other artists, painting my family and my children . . . I had been painting my family for so long that I wanted to do something else, and I thought, "Well, the other family is the art community and people with whom I have a relationship through their work." Then I thought, "Well, there are all of these people who are familiar to us because they use their own bodies or their own faces in their work," so I decided that I wanted to make portraits of pros, the people who pose for themselves. I did you [Cindy Sherman] and Lucas, Alex Katz and Francesco Clemente, and whoever else is in that series" (quoted in J. Kesten, ed., The portraits speak: Chuck Close in conversation with 27 of his subjects, New York 1997, p. 342). In her own work, Cindy Sherman is a master of borrowed personae. She disguises herself in various roles perpetually in the mis-en-scene of a dramatic moment, often with layers of visual drag enveloping her. In Close's painting she instead appears free of all artifice, dressed and portrayed in a "natural" way. She is permitted to look like herself and someone else, anyone. In Cindy II she is rendered in profile, avoiding both the lens and Close's gaze. For someone so accustomed to staring into the camera's lens, here she is presented in an unselfconscious pose, in profile, similar in form to the silhouette portraits of children that make them look so innocent. However, in conversation with Chuck Close, Cindy Sherman stated, "I had no knowledge of what to be." Close replied, "But for someone who's silly-putty in your own hands--you make yourself into whatever you want--it seemed that you were not very interested in producing any particular kind of image for me, which I thought was interesting. When I finally asked you to do things, you had no trouble performing" (quoted in Kesten, op. cit. p. 342). things behind which I hide. It's really hard to look objectively without feeling self-conscious that you are looking at yourself" (quoted in ibid.). "By the late eighties, the photographic look which had been so central to Close's early work seemed less and less of an issue . . . Close now uses a large-format Polaroid that offers him an exquisite level of detailed information, incomparably more lavish in its range than the grainier snaps of the early years; yet virtually no photo effect (focus blur, halation, etc.) nor any surface information (pores or blemishes or wrinkles) is translated to the canvas. Instead, as the paintings' grids have become steadily larger, each box has come to contain a more complex subworld of colors and shapes, vividly teeming with a variegated organicism largely removed from any specific correlation with local descriptive features. As a result, these recent pictures can seem to have less to do with the processes of photography than with those of thought itself: by treading more boldly along the edge of incoherence, they visibly play up the way in which our neural networks form a complex, uniquely specific whole--in this case, an identity, a likeness--from the synchronous firings of dissimilar, fractiously disconnected units" (K. Varnedoe, "Chuck Close Then and Now", in R. Storr, ed., op.cit., p. 66). Close's grid, usually visible as a structure for the image, is different from the cool minimal grids of Agnes Martin, Sol Lewitt or Carl Andre. It shares the same democratic spatial plan, but Close's grid allows each element to stand alone as an individual image in such a way that each colorful square contains its own fully articulated painting. In Cindy II, a target form has replaced the grid, where larger circles radiate from a bull's eye, not unlike the iconic targets of Johns, where the target also serves as the structure of a larger idea.